« Do you have to eat your placenta to be a good mother? For some of us, DIY domesticity is just for fun, or a way to have a hobby that’s in line with our beliefs about sustainability or the importance of good food – we knit to pass time on the subway, we garden with our kids on the weekend to teach them where veggies come from. 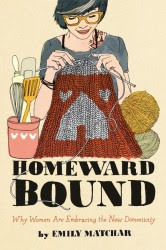 But for others, DIY domesticity is connected to larger lifestyle philosophies. As I’ve been researching my book, I’ve kept hearing terms like “Frugal Living” and “Voluntary Simplicity” and “Radical Homemaking.” These lifestyles, which stress anti-consumerism, localism, self-sufficiency and family, lend themselves to all kinds of old-fashioned domestic work – DIY soap, sewing your own clothes, homeschooling, etc. One of these lifestyle philosophies, the Slow Movement, is particularly far-reaching. Since it began with Slow Food in the late 1980s, it’s been growing by leaps and bounds – there’s now Slow Cities, Slow Parenting, Slow Money, even Slow Books. The basic premise is this: our modern world moves too fast, and life would be more sustainable and more fulfilling if we slowed everything down a LOT. The growing popularity of these movements helps explain the rise of New Domesticity – a parent inspired by Slow Parenting might choose to unschool their kids. A person interested in Slow Food might start growing their own strawberries and canning their own jam. As the kind of person who likes to go fastfastfast, I wonder if I’d make a terrible candidate for the Slow Living lifestyle. As someone who likes to see EVERYTHING when I go somewhere new, Slow Travel might be a challenge. As a person who loves 24-hour grocery stores and midnight movies at the megaplex (and Super-Target! ), I might find living in a Slow City somewhat…slow (though Chapel Hill isn’t exactly a frenzied megalopolis). But I get these Slow Living movements. They’re reactions to a high-tech, sped-up world. They all offer a connection to local tradition in an era of globalism and mass culture. They all claim to offer a path to a more reflective, more fulfilling life. And who wouldn’t want that? Have you heard of Slow Living? To you follow any particular lifestyle philosophy? I used to like to go fastfastfast, but the older I’ve gotten, the more I like the slow life. For me, that is more what the desire to cook & knit is about. It’s that much about the politics or religion. But I’ve always been the sort of person who would rather stay home with a good book than go out clubbing. I love to travel and see new places but I’ve been thinking about where to go on vacation lately and all I really want to do is sit and read and knit, so I think I’m just going to take a staycation this year. That said, you’ll only take my iphone away from me, when you pry it from my cold, dead fingers. As much as I love doing absolutely nothing, I think I would have hard time adapting to much of the slow movement lifestyle. I love city life mainly because I know that when I do want to do something, my options are unlimited. However, I am somewhat of a conundrum when I travel, because I like to divide my time up being busybusybusy and then doing absolutely nothing and having no agenda. I would rather have one jam packed day and one day of nothing than spread it out over 2 days. Im somewhere in the middle. I refuse to multi task, ever, and have done so for quite awhile. I believe in giving all of my cocentration to the task at hand.